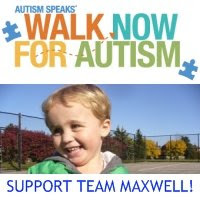 I would like to invite all of you to pledge to Team Max in this year's Walk For Autism. Max's mom, Katrina, has been deeply kind and supportive of me in the last few months. She played matchmaker for us with some of her friends who were looking to give away baby things they didn't need any more. She encouraged me when I was miserable and sick and wondering what the hell I had gotten myself into. And what I wonder, every time a note pops up from her with a word of advice about something I've complained about, or a check-in to see how I'm doing, is where the hell does she find the energy? Recommended treatment for autistic kids: Intensive Behavior Intervention. This is most effective between the ages of 2 and 5. It is recommended that children get a minimum of 21 hours a week of therapy. The cost, out of pocket, is $45 an hour. The wait list for funding for this therapy, as I understand it, is currently hovering somewhere between 2 and 3 years. That doesn't take into account how long you might have to wait to get a diagnosis in the first place. When I think about what this would mean for us--that in order to get appropriate treatment for our child, we would have to pay out more money than we make--I feel sick. And when I read about what Kat's working on to make sure Max gets all the opportunities he deserves, I feel inspired. Posted by 'col at 5:37 p.m.